I went for a max chin-up attempt the other day and got 11 good reps with the form I was aiming for. Going over 10 reps was a milestone for me as I was stuck on around 7 or 8 for ages! However, once I had broken through that particular plateau, progress was faster and I’m now aiming for 20. Improving my max pulling strength through deadlifts and other pulling exercises. Practising frequently (several times a week) and doing 3 or more smaller sets, not going to failure. There’s no one right way to train chin-ups or pull-ups, but I can share what worked for me. I think general pulling strength is very useful. Most of you reading this will be all too aware that few people in the gym bother to deadlift, whereas you cannot move for people benching or shoulder pressing. In fact, attempting chin-ups or pull-ups might be the heaviest pulling exercise people ever do in the gym, which makes it them difficult to improve. However, if you are already deadlifting upwards of 150% of your own bodyweight, your ability to do bodyweight chins should improve greatly. I’ve also been training other pulling movements in recent months, such as cleans (explosive full body movement), rack pulls (very heavy loads), inverted rows and indoor rowing (pulling endurance and power). I am sure that all of these have gone into the mix, although it is impossible to judge to what extent an individual exercise has contributed. The bottom line is, I have been doing far more pulling exercises than pushing exercises. When I actually train chin-ups or pull-ups, I don’t often train to failure. Instead I concentrate on volume of reps. For example, going for 8 reps in the first set, then 6 in the second, then 4, then 2. So I’ve done 20 reps in that session. Another method is to go for an achievable number in the first set, and then try to do the same for the second and third sets. So I may start with 8 in the first set, which is hard but achieveable, and try to do it again. I probably won’t manage it, but I’ll get perhaps a 6 and a 5. Keeping an eye on your rest periods between sets is also a good idea. If the ultimate aim is for a high rep set, such as 20 chin-ups, you want to keep your rest periods short – although not so short that you can’t recover because you do need to get that volume in. I also don’t train chin-ups or pull-ups every day. I’ll do them perhaps 3 or 4 times a week, usually at the end of a training session. My max attempt above was done after a heavy squat session. This has pros and cons; yes, you are definitely fatigued from the heavy lifting session. On the other hand, you are well warmed up and primed to lift efficiently. Bodyweight chins feel comparatively light after powerlifting, so you can trick your mind into thinking they are easy! I have recently started doing weighted chins, although it is too early to know what effect this will have on my chinning ability. If it helps me on my way to 20 in a row, I will let you know! Experiment with hand width to find your strongest pulling position. Shoulder-width apart is the default, but try narrower and wider to see if it makes a difference. Try to pull with your back as well as your arms. Make the connection with your mind, try to visualise your lats pulling you up. Train both chin-ups and pull-ups (overhand and underhand grips) in order to improve. Also, try doing them on awkward objects like a beam, rings or the branch of a tree. Don’t compromise on form. If you are aiming for deadhang chin-ups or pull-ups, make sure you straighten your arms after every rep. If you start cheating on reps, it is more difficult to come back from that and find good form again. I have covered other methods of training pull-ups in How to do pull-ups. You don’t have to use every method under the sun, in fact this may be counter-productive. Pick a method that seems to fit with the way you train and your own strengths and weaknesses. Progress is rarely linear and we all have those frustrating plateaus, but there’s no substitute for just plugging away and working hard. Do you have any useful tips for chins and pull-ups? I was at the gym the other day and I saw some of the instructors working out, they were doing what looked like a reverse press up on the smith machine. 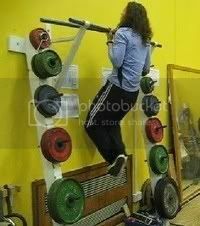 I’m not sure what it’s called, but it had been recommended to me to help with the chin ups. I shall ask. I got this weird love-hate relationship with chin-ups. I find them hard and difficult, but also love being able to do them properly. My goal is fifteen clean, full-length chin-ups right now. What helped me over a slump once was doing l-sit-chins instead of normal ones for a couple of weeks. You know, the ones where you hold your legs straight in front of you. I felt that doing them that way forced me to be much tighter and to move in a more controlled manner. Worth a try, I guess. Give them a go by all means and let us know if they work. However, you might find that a barbell or cable row works better because you can add weight to it more easily than to an inverted row. The issue with inverted rows is that you might get better at them but because you are not adding weight, you are not actually increasing your pulling strength. @ Markus: good tip, I might try that for a change instead of doing weighted chins. Yes, I think I’ll try that. @ Rooroo: good luck, let us know how you get on. Place chair slightly behind your bar. Place your feet on the chair behind you while you still hang. This drop the amount of weight that you’re pulling uup. I shall! Decided to record my progress and write some thoughts, see linky! I have been training pullups by giving a slight hop at the bottom- it’s not a jump, though it’s certainly giving some assistance. I think it’s becoming a psychological issue though; I’m not feeling like I can get the motion started without that little hop, even though it’s really not much. I think I will have to try to cut it out, or at least fail on unassisted pullups before I start assisting. Do you have any thoughts on kipping? I want to learn this but my efforts so far at the gym have not been too successful- I worry I’m going to bump into someone, it’s usually kind of crowded. I’m waiting for my home pullup bar to arrive in the mail, when it does I suppose I can practice the kip without so much worrying. @ Justin_P: Thanks for posting that tip! @ Rooroo: Good luck! I shall be checking your blog. @ Mnem: Re kipping, I’ve recently started to learn the kipping pull-up so that I can do Crossfit workouts and add that string to my bow. I can put a few together but they don’t feel solid yet – I’m using too much strength and not enough kip! If you’ve got a home pull-up bar, you’ll be well away. Check out the vids on http://www.crossfit.com for some good technique pointers. This is a fallacy. The wider your grip the harder it is. I think you have slightly misunderstood me – or perhaps I wasn’t clear enough. I am not talking about wide grip pullups (which – as you point out – are much harder), I am talking about whether you have your hands in line with your shoulders, just outside them or just inside them. The difference is a matter of centimetres. For example, I use a different hand position for pullups as I do for chinups – that is what works for me. My hands are closer together on chinups (but not too close – you do need a bit of space). I have been trying to blast out my number of chin-ups for years! I have to do a PFT for the USMC now and again and receive pts. for them. I have always wanted a fat set of 20. I got 18 in bootcamp when I was 19 yrs. old. BUT, now I’m an old timer and can do 6 good ones. I am going to buy wrist hooks and attach a 10 lbs.plate to my waist and go balls out. This has helped me get to 10. Weighted chins are great for improving the non-weighted numbers. I’m doing the Twenty Pullups challenge (http://twentypullups.com/) at the moment and it seems to be working really well. I’ve already breezed past my previous max and I’m only a couple of weeks in. It is a simple ‘grease the groove’ style programme but gets the job done.